Everyone is hyped for Halloween and it’s sweet, sweet candies. 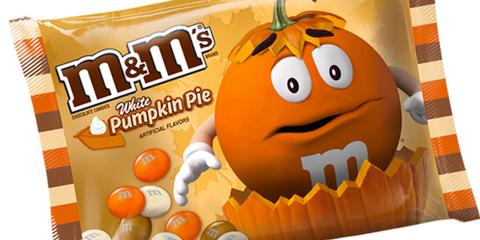 New on the market for trick or treating sugar highs are M&Ms White Pumpkin Pie and even their new Pecan Pie M&Ms. Capturing all those who are constanly searching to spice up their lives, Starbust and Skittles have gone with sweet heat versions of their classic candies. Look for flavors like Fiery Watermelon, Flamin’ Orange, Mango, and Pipin’ Pineapple. Those looking for a calmer option may want to try Skittles Smoothie Mix, a pastel dream of fruity flavors. Caramel Apple Milky Way may not be entirely new, but they only seem to hit the shelves during the Halloween season. Still in time for fall is pumpkin spiced everything including Pumpkin Spice Kit Kat. Spooky treats abound including Muskefear bars filled with spooky red nougat. Want a fun shape? Reeses has ghosts, Hershey’s skulls, Sweet Tarts has Skull and Bones, and Peeps has gone Cat crazy.